VASCO Pump Controllers (VAriable Speed COntroller) are a purpose-built family of variable frequency drives, designed to control and protect pumping systems based on changing pump speed. From water supply for domestic, irrigation, commercial and industrial applications, to heating and air conditioning, from filtering to pressure-washing, the VASCO range perfectly fits any new or existing application. 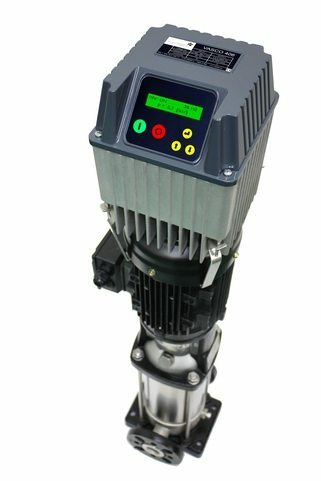 VASCO units are extremely compact and, connected to any pump on the market, will manage the operation of the pump to maintain a constant desired physical dimension (such as pressure, flow, temperature or other). The pumping system runs only at the speed necessary to meet user’s requirements, ensuring energy savings and extending the life of the system. Body is constructed entirely of aluminium, making VASCO, with its compact dimensions, extremely solid, lightweight and easily cooled, adding to the unit’s versatility. The degree of protection, IP55 makes it possible to install VASCO virtually anywhere, including humid and dusty environments; the liquid crystal illuminated display ensures VASCO is easy to operate and a buzzer provides an immediate indication of alarm.